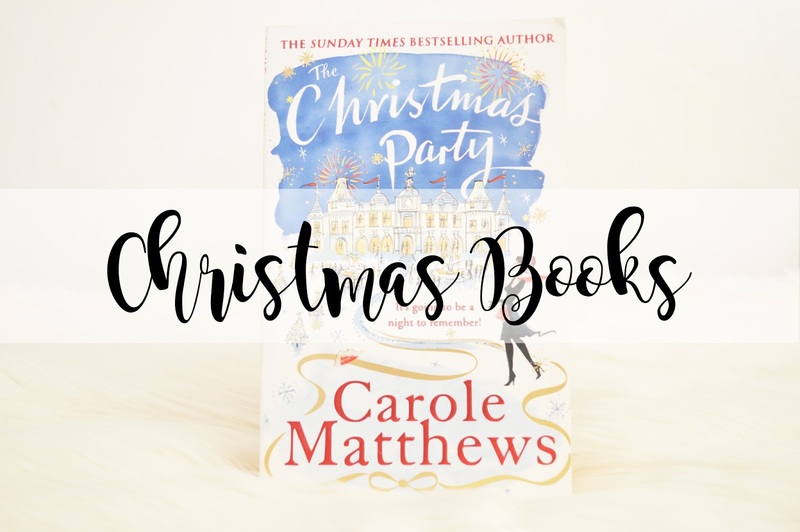 Today I am going to be sharing my collection of books which are perfect for Christmas and I know you book bloggers out there are going to love this! I never intended on buying these specifically for Christmas or Blogmas. When I bought these I had no idea I would be doing Blogmas, so it's exciting for me to be sharing these with you! I really like the idea of Christmas themed books, just because it makes reading that little bit more exciting, especially when it's the run up to Christmas too. I can't lie, there's no way I will read any of these books before Christmas as I just do not have the time but they are there for after Christmas when I'm feeling down because it's all over! I picked this up the other day literally because it said Mince Pies, but it's the "Mince Pies and Mistletoe at The Christmas Market - Heidi Swain". I also found this intriguing because it's about a girl called Ruby (my dog is called Ruby) and she's at University, which I am too. I just got very excited about this book! I think it's going to be a really good read and I've never read Heidi's books before so I will 100% review this! Once I've read it of course whenever that will be! "Christmas has arrived in the town of Wynbridge and it promises mince pies, mistlete and a whole host of seasonal joy. Ruby has finished with university and is heading from for the holidays. She takes on a stall at the local markets and sets about making it the best Christmas market stall ever. There'll be bunting and mistletoe and maybe even a bit of mulled wine. But with a new retail park just opened, the market is under threat. So together with all the other stallholers, Ruby devises a plan to make sure the market is the first port of call for everyone's Christmas shopping needs. The only thing standing in her way is her ex, Steve. It's pretty hard to concentrate when he works on the stall opposite, especiall when she realises that her feelings for him are still there". Katie Flynn is one of my favourite Authors and I have so many of her books, there's only a couple of her books which I haven't picked up yet. Although I'm not entirely sure how this is based upon Christmas (I'm guessing it's around Christmas time and she wants her sight back for Christmas), but Katie's books are incredible and I'll read it regardless! If you haven't ever read Katie's books, I highly recommend them! "It is the Autumn of 1945 and identicla twins Joy and Gillian Lawrence are on their way home to Liverpool, having been evacuate to Devonshire five years earlier. Their mother has been killed in the Blitz but the girls hope that with their beloved father's help they will be able to manage without assistance. All goes well until there is a terrible accident and Joy loses her sight. At first she is bitter and resentful whilst Gilliant is racked with guilt. However, as time passes Joy gains confidence, hopeful that her sight will retrn since life is not easy when you can't see the face of the boy you think you love. Then there is a chance meeting on a train and once more the girls' lives are in turmoil.."
Carole Matthews is another one of my favourite authors and I picked this book up last year and I still haven't read it! I think this is so exciting and intriguing and I really want to know what the dangerous games are! But finding the time to read is impossible most of the time, but I'll try and read this at some point through January maybe, or even the week after Christmas! "Louise Young is a devoted single mother whose only priority is providing for her daughter, Mia. Louise has a good job in a huge international corporation and she's grateful for it. The only problem is her boss who can't keep his hands to himself, but Louise can handle him. What she really doesn't have time for is romance - untl she meets the comapny's rising star, Josh Wallace. Louise usually says no to evenings out, but she's decided to let her hair down tonight. It's the office Christmas Party, she has a pretty dress to wear and she's looking forward to some champagne and fun. She's completely unaware that others around her are too busy playing dangeous games to enjoy the party - until she's pulled into those games herself..."
I have read the first book of this series and absolutely loved it and I haven't got round to reading the rest of the series yet however oh my god, it is incredible! I'm slightly annoyed that I now know Chantal has had a baby which I didn't know! But hey ho, that's what happens when you read the blurb of a book! This series is perfect for any female, you will honestly love reading the first book and I'm sure the rest are just as incredible! "Christmas is just around the corner but the women of The Chocolate Lovers' Club have more to worry about than present shopping... Lucy loves running Chocolate Heaven but she hasn't spent time with her boyfriend, Aiden, in weeks. And then her ex-fiance turns up and things become even more complicated. Nadia hasn't let herself get close to a man in a long time, yet she can't hep feeling drawn to Jacob. Will he be her last chance of a happy ending? Chantal and her husband, Ted are besotted with their baby daughter Lana - but Chantal isn't sure that's enough to base a marriage on. Autumn is dealing with a tragedy that has hit too close to home. But when she doesn't get the support she needs from her fiance, will she look elsewhere for comfort?" What's on your Christmas reading list this year?